The impedance matching transformer is probably just as important for the sound quality as the actual speaker. Just any old transformer won’t have a flat frequency response from 20 to 20 kHz especially when it’s making kilovolts at the output. You don’t want flat response in this application. 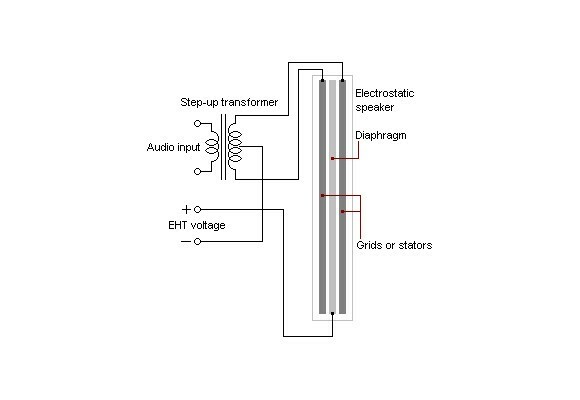 Electrostatic diaphragms respond differently than voice coil type speakers. You also don’t need it to cover a large frequency range because these are only base speakers, You only need 20 – 1000KHz or so. Also I think it’s important to note that a perfectly flat frequency response and ultra-low THD is what oscilloscopes and other test equipment like to listen to; people much less often. All that classic audiophile equipment which really gives us the tingles is usually making its own contribution to the sound, and secretly we love that. I always hated to see an audiophile product that touts some incredibly low THD, like a fraction of a percent, as if anyone but a stack of lab equipment could discern such a thing–but its power handling is only like 20 watts RMS. If you go by double-blind experiments, the thing listeners really like most is power. Even if it’s not necessarily turned up to 11, systems with a higher power ceiling don’t struggle with the dynamic range we love to listen to. What’s all that coveted vintage gear got in common that is so rarely seen in modern amps and speakers? POWERRR. From oversized discrete components that shrug off thermal effects through brute inertia and surface area, plus transformers that weigh as much as a cinder block. Probably not as technically high in fidelity, but it’s what people want when given the choice. Am I somehow abnormal because I haven’t yet found a headphone, speaker, or sound source that I hadn’t had to equalize about -3 dB down around 2 kHz? It’s in the upper ranges of vocals, which makes singing sound like it’s coming from a soup can and over-pronounces the S.
Or is everyone else hearing impaired from having their ears talked off? Or is everyone deliberately designing loudspeakers that over-emphasize the speech range? The article is rather interesting. What he’s essentially saying, the 70 – 18 kHz transformer sounds good at the low end, because it distorts the sound in a way that frequency content below 70 Hz is gradually “aliased” up to twice the frequency (2nd harmonic) which has the psychoacoustic effect on the human brain to think that it’s hearing the fundamental tone (missing fundamental). That’s actually a trick used in portable speakers and boomboxes to patch up their bass response. They sound like they have it, but they lack the actual punch, obviously because a small speaker can’t move much air. A similar trick is sometimes used deliberately in music producing to make pop music sound better on cheap players. It’s mostly about the intent, what you’re doing with your music equipment. You wouldn’t put delicate recordings of classical music through a “BassMAXXX” filter, even though it might make your Armin Van Buuren album sound delicious. The point is that the best amplifier (and the best speaker) is totally transparent to sound, so you can do everything you want at the source, and the system reproduces it faithfully exactly how you want it. You want to crank it up to 11, that’s fine, because the system goes up to 12. That’s why it’s also ironic how audiophiles fawn about some amplifier being crisp or warm. If the amplifier colors the sound in a perceptible way, it’s a bad amp. This is also why hi-fi-ism is prone to voodoo – they’re comparing what should be imperceptible differences in the first place, so in the end you’re just comparing your own ears. I think there is no “good” or “bad” when it comes to things of highly personal taste and emotions like the sound of an amp. Of course “the perfect amp” should sound like a piece of wire; but where’s the fun in that. I get goose bumps when I listen to my fully cranked up 50s console with a (at least…) two digit THD. As an example. But, as mentioned, that is highly personal/mental/emotional. The write-up is fascinating reading. I owned a pair of ESL57 in the late-70s, driven with a Quad 33/303 combo. This was by far and away the best hi-fi I ever owned. Sadly they were too big and had such a narrow listening angle that I ended up replacing them with Lowther Acustas. The friend I sold them to paired them with older Quad valve amps and had them in a nice big living room. If you have the space, they are the flattest sounding speakers you can buy. In the mid-80s I had a demo of a pair of refurbished ESL57s against a pair of almost new ESL63s. On orchestral music there was nothing in it, but on solo piano the older speakers were noticeably cleaner. While on a trip to the US in the mid-90s I visited someone who had a basement TV room with a video projector and a pair of big electrostatics. There was enough room to have about 4 or 5 feet behind the speakers. They had black fronts, and looked like the KLH 9. The sound was fantastic! However he did have a separate bass unit behind the screen. The interesting thing I remember was that he had found that the bass needed to be turned down because the mid and top range was so clean. Its a while now since my hearing has warranted having a top notch hi-fi. Now my system is a pair of JVC bookshelves from a late-90s mini-system, and a generic Chinese Class-D, plugged into my TV. I have most of my music stored as OggVorbis files on a NAS, and listen using the VLC app on a Fire TV box! Nothing remotely like the setup I had until about 20 years ago. No tape, no vinyl, and most of the time, no CDs.